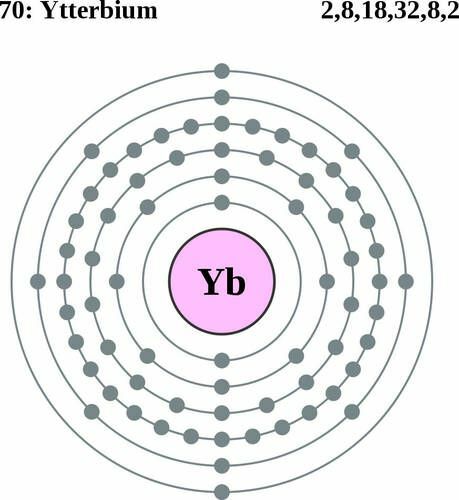 Ytterbium (pronunciation: i-TUR-bee-em)  is a malleable, ductile, bright silvery metal  that belongs to the group of lanthanides and is represented by the chemical symbol Yb . It has seven stable naturally occurring isotopes, out of which 174Yb has the greatest natural abundance (32.03%), while 176Yb is the most long-lived with a half-life period of 1026 years [1, 4]. 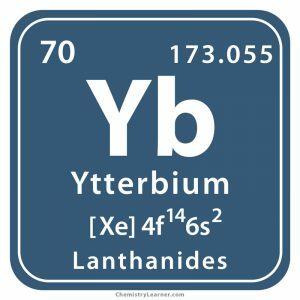 Ytterbium, like other lanthanides, is commonly obtained from the mineral monazite and is separated through solvent extraction and ion exchange procedures . 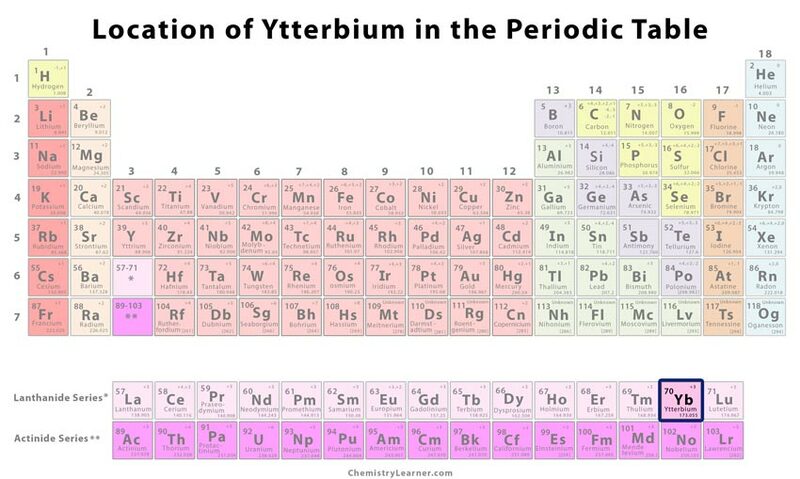 The top 3 ytterbium-producing nations in the world are China, Russia, and Malaysia while the top 3 countries with the largest ytterbium reserves include China, CIS Countries, and the USA . Origin of its Name: It is named after Ytterby, a town in Sweden where the element was first found . Who discovered it: Jean Charles Galissard de Marignac, a Swiss chemist, is known for its discovery . 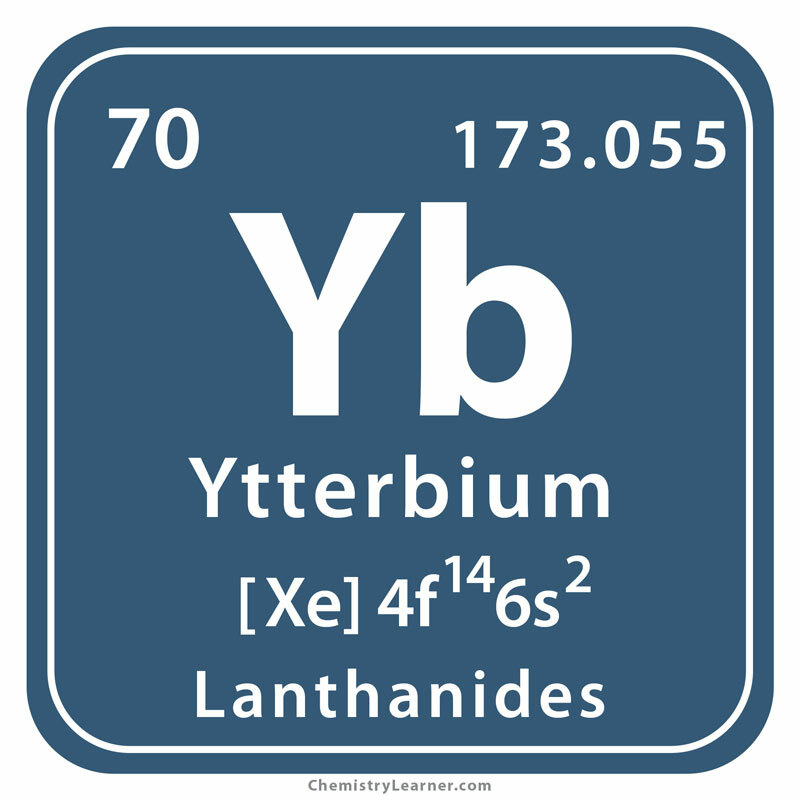 In 1794, the Finnish chemist Johan Gadolin discovered yttrium, a metallic chemical element that the scientists believed was a source of other lanthanoids (rare-earth elements) [1, 2]. In 1843, the Swedish chemist Carl Gustaf Mosander separated yttrium into terbium and erbium . While experimenting with erbium at the University of Geneva in 1878, Charles Marignac was able to isolate ytterbium by heating erbium nitrate, obtaining red erbium oxide and a whitish element that he named ytterbium . In 1937, Klemm and Bonner heated ytterbium chloride together with potassium to produce a small quantity of impure ytterbium metal [1, 5]. A purer form of ytterbium metal was made in 1953 by David Dennison, A. Daane, and Frank Spedding at the Ames Laboratory in Iowa . It can be added to alloys like stainless steel for improving its strength, grain refinement, and other mechanical properties [2, 5]. Its radioactive isotope 160Yb is used as a source of radiation in portable x-ray imaging equipment . 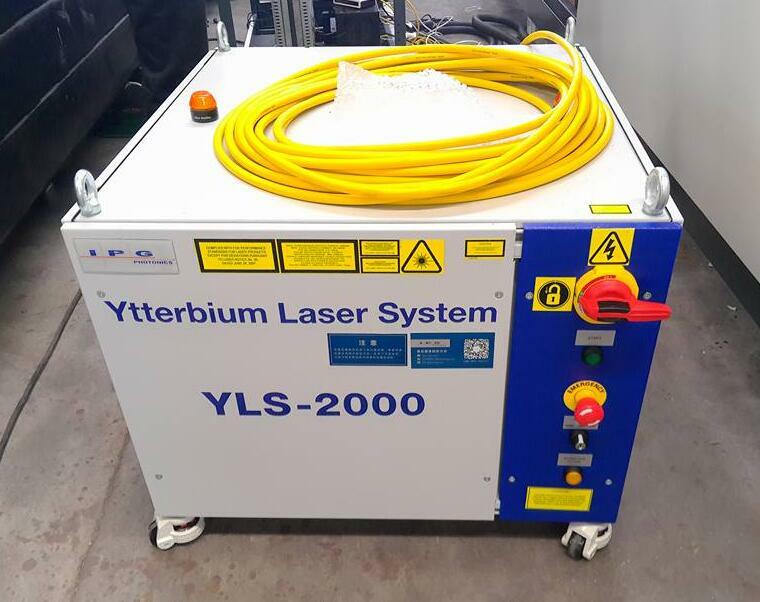 Ytterbium-doped fiber amplifiers in tunable lasers are used for marking and engraving . Ytterbium compounds are now increasingly used as industrial catalysts in place of other catalysts that are considered to be hazardous and polluting [1, 5]. Since the electric resistance of ytterbium increases with increase in physical stress, it is used in strain gauges for seismic stress monitoring . 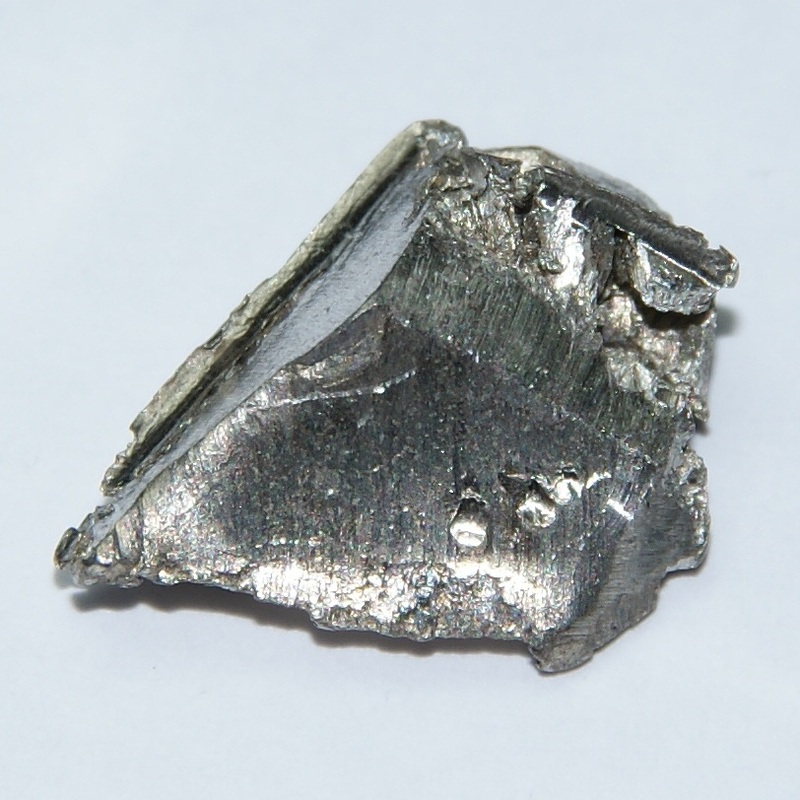 Ytterbium is considered slightly toxic , and its compounds can cause skin and eye irritations. Metallic ytterbium dust catches fire spontaneously, and the fumes are harmful to human health . The element 70 is sometimes represented by an image based on ancient rock art found in Sweden , because the element was found in the same country. Two atomic clocks, based on ytterbium, were combined by scientists at the NIST (National Institute of Standards and Technology) in 2016 to create the most stable clock in the world . 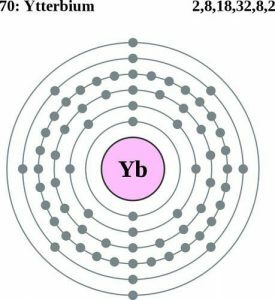 While 100 grams of pure ytterbium cost around $1,400, the same amount of the element in bulk costs around $550 .